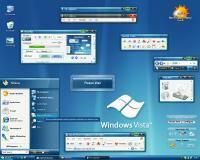 Customize the look and feel of Windows XP or Windows Vista with WindowBlinds. WindowBlinds is a program that enables users to completely change the look and feel of the entire Windows user interface -- title bars, push buttons, scrollbars, the Start bar, and more. Version 6 adds full skinning support for Windows Vista as well as support for "blurred glass" on Windows XP.